Paley Park in Manhattan Urban Courtyards: The Next Alternate Workplace? 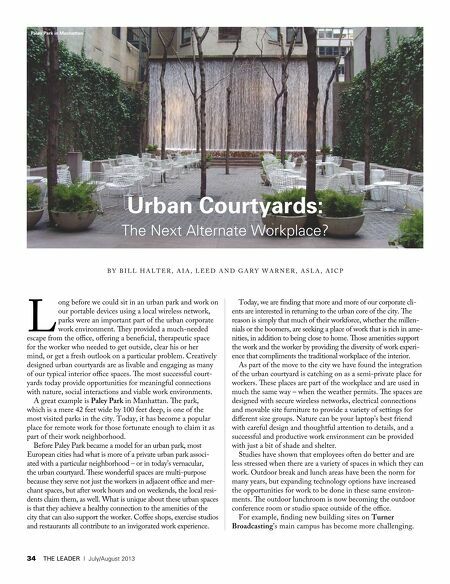 BY BILL HALTER, AIA, LEED AND GARY WARNER, ASLA, AICP L ong before we could sit in an urban park and work on our portable devices using a local wireless network, parks were an important part of the urban corporate work environment. Tey provided a much-needed escape from the ofce, ofering a benefcial, therapeutic space for the worker who needed to get outside, clear his or her mind, or get a fresh outlook on a particular problem. Creatively designed urban courtyards are as livable and engaging as many of our typical interior ofce spaces. Te most successful courtyards today provide opportunities for meaningful connections with nature, social interactions and viable work environments. A great example is Paley Park in Manhattan. Te park, which is a mere 42 feet wide by 100 feet deep, is one of the most visited parks in the city. Today, it has become a popular place for remote work for those fortunate enough to claim it as part of their work neighborhood. Before Paley Park became a model for an urban park, most European cities had what is more of a private urban park associated with a particular neighborhood – or in today's vernacular, the urban courtyard. Tese wonderful spaces are multi-purpose because they serve not just the workers in adjacent ofce and merchant spaces, but after work hours and on weekends, the local residents claim them, as well. What is unique about these urban spaces is that they achieve a healthy connection to the amenities of the city that can also support the worker. Cofee shops, exercise studios and restaurants all contribute to an invigorated work experience. 34 THE LEADER | July/August 2013 Today, we are fnding that more and more of our corporate clients are interested in returning to the urban core of the city. Te reason is simply that much of their workforce, whether the millennials or the boomers, are seeking a place of work that is rich in amenities, in addition to being close to home. Tose amenities support the work and the worker by providing the diversity of work experience that compliments the traditional workplace of the interior. As part of the move to the city we have found the integration of the urban courtyard is catching on as a semi-private place for workers. Tese places are part of the workplace and are used in much the same way – when the weather permits. Te spaces are designed with secure wireless networks, electrical connections and movable site furniture to provide a variety of settings for diferent size groups. Nature can be your laptop's best friend with careful design and thoughtful attention to details, and a successful and productive work environment can be provided with just a bit of shade and shelter. Studies have shown that employees often do better and are less stressed when there are a variety of spaces in which they can work. 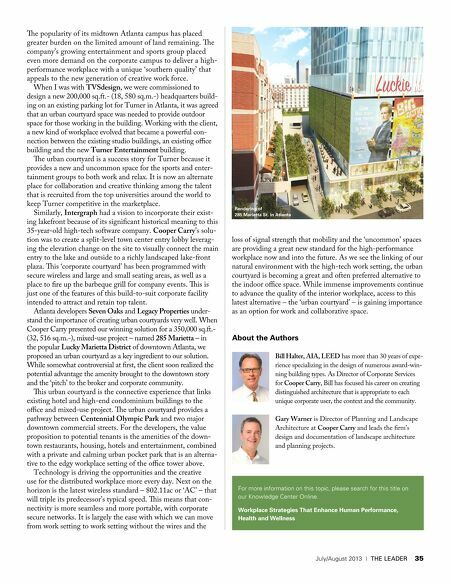 Outdoor break and lunch areas have been the norm for many years, but expanding technology options have increased the opportunities for work to be done in these same environments. Te outdoor lunchroom is now becoming the outdoor conference room or studio space outside of the ofce. For example, fnding new building sites on Turner Broadcasting's main campus has become more challenging.